Care2 Healthy Living | Are You Overpaying for Electricity? Your electric bill is probably increasing, even if you still turn off the lights whenever you leave the room. The Denver Post recently reported that the price of electricity for most residences here in Colorado jumped 15 percent in the past year. Both electric rates and additional fees on electric bills are going up around the nation. However, you can potentially minimize cost spikes by carefully reading your bill, checking your consumption and comparison shopping. The convenience of automatic bill pay and online banking comes with a danger. We may be less diligent about reviewing utility bills, and may even miss a major spike or an erroneous charge. Even if you don’t have to write a check, review the usage listed on your bill every month. Compare electric usage to previous months in kilowatt-hours, not dollar amounts. The actual bill may vary for the same amount of electricity depending on added fees or rate hikes, but more on that later. The average home uses 920 kilowatt-hours (kWh) of electricity per month, according to the U.S. Energy Information Administration. It’s fairly easy to use less than the average by switching out light bulbs, turning down the thermostat, turning off vampire appliances, etc. 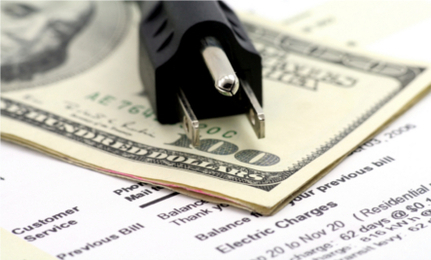 However, if your bill shows significantly higher consumption, either you or the electric company may have a problem. • An unusually high bill may simply be an accounting error or a misread meter. You can double-check the electric company’s work by looking at your meter. It should be slightly higher than the meter reading at the end of your last billing period. • If the meter and the bill match, but the usage seems unusually high, make sure the meter is working correctly. It should stop spinning when you turn off every appliance, light and gadget (though it’s easier and more foolproof to test the meter by shutting off all your breakers). If it still spins, it may either be broken or a neighbor’s circuit is inappropriately wired onto your meter. You can also ask most utility companies to test the meter for accuracy. If the meter is working and the usage is reasonable, but the bill is unreasonable, you may have more options than you think. Many states have recently opened their utility markets to new competitors. Texas has a particularly robust electricity market. I found more than 20 rate plans from at least six providers for a ZIP code in Dallas. You may still effectively have a monopoly, but the company may offer various rates. Look for long-term contract savings and low-income discounts. If you are getting the best possible rates and the meter is working, faulty wiring or a faulty appliance may have cause the spike in your bill. If you switch off all the breakers and the meter stops running, test each circuit and each appliance. Unplug everything, then individually turn on breakers and plug in each item. If the meter starts to spin with a breaker on but nothing running on that circuit, you may have faulty wiring. More likely, the meter will really get going when you turn on the air conditioner or other electricity hog. Use a watt-hour meter, such as a Kill-A-Watt, between the outlet and the appliance to check the true energy usage of your devices and appliances. If you think you are overpaying for electricity, check the electric company’s numbers and meter, then check your wiring and appliances, and shop around if you can. I know my bill is going up and I blame that on the utility providers since my usage is the same but their rates are not. What worries me is that we need utilities like electricity to survive but it's getting harder to pay for it with the rising costs of everything. I get the feeling utility customers are paying more just so that the executives and managers there can have fatter paychecks. Sigh. Guess I'll have to start really reading the bills. But really thanks for this. Every dollar helps. Here in NY state you can opt out of National Grid as your electricity provider but you still have to pay them for the delivery of the electricity. they more than doubled their delivery charge 2 months ago. My bill, even though I have cut my usage substantially, went up $100. How are you supposed to save. No COLA or $250 one time payment for SS recipients this year. That's 2 years in a row. That was supposed to be www.energybuzz.ichoosesavings.com. Sorry about that. Many states are deregulated and you can choose who you get your electricity from. If you live in NY, NJ, CT, MA, PA, or MD check out www.energybuzz.ichooseavings.com. There are great rates and a Customer Appreciation Program where you receive Savings Dollars each month just for paying your bill. You can redeem the Savings Dollars on everyday things like travel, dining, gift cards at major retailers, etc. I looked at dozens of alternative energy providers and this was the best deal I saw. I liked it so much I got involved part-time as an energy consultant. We also offer awesome energy savings products like solar panels, LED bulbs, etc. in every state. Check it out - you won't be disappointed. Almost everyone I have told about it has switched. There is no risk and no cost to switch - just a great deal! We also offer commercial rates. You can email me for details. No matter how many lights I turn off, or energy saving light bulbs I change to, I can't stop my bill from being expensive. I tried to call the electric/gas company but they don't want to hear it. I feel like they are robbing me. Most utilities are required to provide at least some green energy but it is usually only in the single digits like 7-9%. I can show you a greener source where your electricity will be 20% green. Switching to that will not only save you money on your bill, but it can be the equivalent of planting from 40 -114 trees or not driving from 775-2115 miles annually, depending on the state you live in. Just think of the impact you can make on the environment! If you live in Maryland, Connecticut, Pennsylvania, New Jersey (or New York in early 2011), go to www.viridian.com/sharpe and save 10% on your first bill by changing to 20% green by December 31, 2010. There is zero cost and zero risk. Yes! It should be free!